Simbithi : Ilanga 7 - Chakas Rock / Shakas Rock Accommodation. Your stay with us will be very special, affordable, overwhelming and value for money. Come where you are celebrated!! It is 20 minutes north of Durban, 500m from N2 highway, only 65km from Durban International Airport, 40km from Gateway Centre and 650km from Johannesburg (5.5 hours drive). Ilanga is a very private, comfortable, spacious and secure residence which offers a panoramic view of the ocean from every room - this is overwhelming. The living area, diningroom , kitchen area and 3 of the bedrooms leads all out on deck which overlook the ocean. Stunning Stunning. Four bedrooms (3 double & 2 single beds) and 3,5 bathrooms. All rooms with patio doors on spacious patio overlooked the breathtaking ocean. Modern kitchen fully equipped with micro-oven, dishwasher, washing machine, tumble-dryer. Breakfast nook for family gatherings around the kitchen. Open-plan living area lead to a spacious deck on outside with designer swimming pool. Four deck chairs make this a unforgettable and allow you to relax. 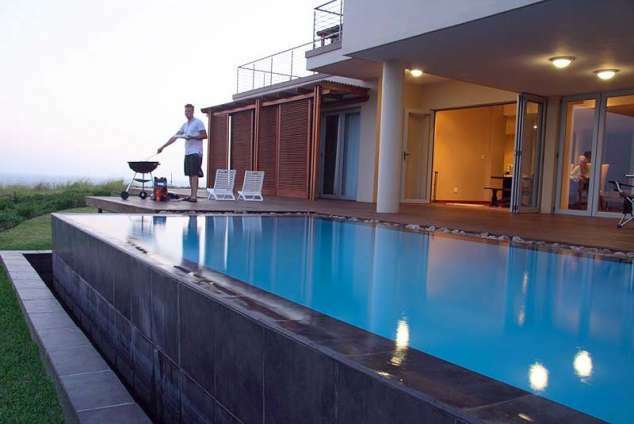 Enjoy a sundowner on own deck with 180 degree elevated sea views. This is a talking point. Weber is available. Double garage. Flatscreen television & DSTV PVR. 24-Hour security allows you to relax and forget about the stresses of every day life whilst enjoying the tranquility of nature. These pristine surroundings make bird watching an extra-ordinary experience. You will also have access to Simbithi's 18-hole Peter Matkovich golf course (nearly finished), equestrian centre, tennis courts, pools, restaurant, dams and abundant wildlife. Please Note: Please bring your own towels. All linen provided. House serviced every Monday, Wednesday, Friday and Saturdays. Extra days: we can organized @ R100.00 per day. Enjoy a holiday you will never forget. Rainfall: average 950mm per year. A booklet with information and telephone numbers available in home. Simbithi can easily be found just off the N2 from Durban, pass the Ballito turn-off, take Shakas Rock turn off, right towards sea 1.5km, right at second gate to Simbithi Estate, (Need Code To Enter Gate). Left at circle (Tambotie Avenue) – drive up and left at ILANGA entrance. Go straight and turn right near building – keep on 'till T-junction (sea in front of you). Go left down to garagedoor (number 7). 127217 page views since 07 Dec, 2006.